Defence Secretary praises Royal Navy efforts in the Mediterranean as HMS Bulwark conducts its largest rescue to date. 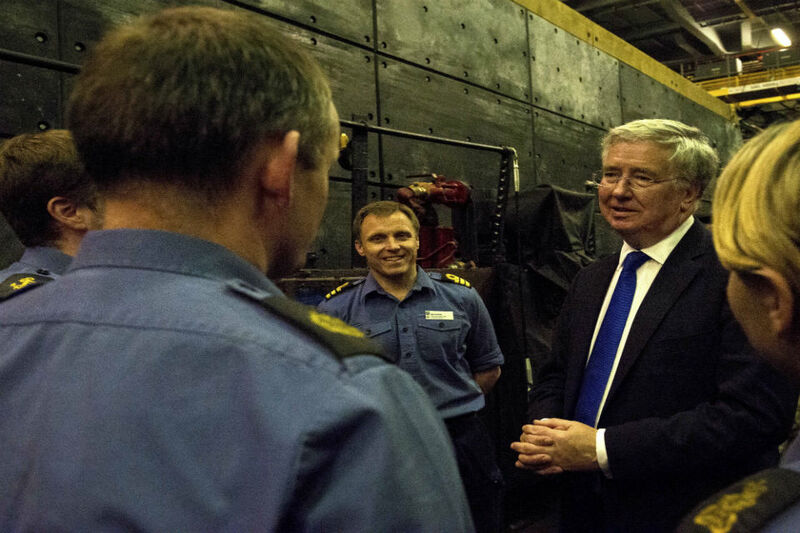 On a visit to HMS Bulwark, Defence Secretary Michael Fallon praised efforts being made by the Royal Navy in the Search and Rescue operations in the Mediterranean. Mr Fallon’s visit came as HMS Bulwark was called to assist with its largest rescue operation since deploying last month, which has so far today seen over 1,000 migrants being rescued. 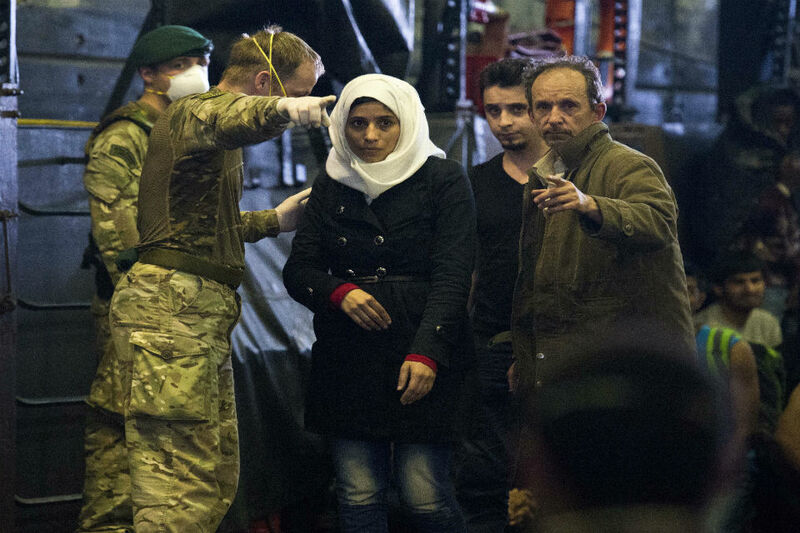 This brings the total number of individuals rescued so far by HMS Bulwark to over 2,700. The latest callout saw the use of all eight of HMS Bulwark’s landing craft and amongst the migrants rescued are at least 10 pregnant women. These migrants are part of a wave of more than 3,000 that have recently left Libya in an attempt to cross the Mediterranean. 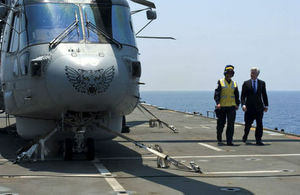 HMS Bulwark and three Royal Navy Merlin Helicopters deployed on 5 May and have played a leading role in the Search and Rescue mission, part of a wider EU effort to stem the flow of irregular/illegal migration across the Mediterranean. HMS Bulwark continues to play a vital role saving lives at sea and I want to thank them for their unwavering efforts. However, we cannot simply deal with the symptoms of this problem; we must go after the route cause and the trafficking gangs behind it who are making money out of human misery. Working alongside the Italians, Germans, French, the Netherlands, Irish and the Portuguese, we are showing how European navies are working together with their ships and helicopters, to bring about a successful temporary solution. But now it’s time for Europe as a whole to work together to agree a solution, before we see a greater loss of life. Starting very early this morning this has been an intense, complex day. My helicopters have done a brilliant job locating a number of migrant vessels and my landing craft have effected their rescues with typical professionalism and complete success. While the rescue operation is still ongoing, this is already Bulwark’s largest rescue mission to date. We have conducted five separate rescues already today with a further two ongoing. In many ways this search and rescue mission is like an amphibious operation – I’ve deployed landing craft and aircraft in multiple waves, in poor visibility, operating autonomously over the horizon – the objective this time of course, being to save life. But it’s only through being trained for high intensity warfighting operations that we are able to execute such activities in peacetime. Since the EU operation was established at the Foreign Affairs Council last month, as well as deploying HMS Bulwark and three Royal Navy helicopters, the UK has also contributed five military personnel to the Operational Headquarters, based in Italy. The Operational Headquarters (OHQ) is now conducting initial planning with an aim to developing a comprehensive solution which will help the countries where these migrants come from to reduce the push factors for irregular migration; to build stability and create livelihoods; and to go after the criminal gangs and trafficking networks which are profiting from this activity. During his visit to the region, Michael Fallon also spent time in Malta, a country with which the UK has strong historical links. We value our close partnership with the Maltese Armed Forces and welcome the crucial support the island provides to our forces and warships operating in the region, including HMS Bulwark. I look forward to our strong partnership and close ties continuing into the future.